Grilling burgers is one of our favorite summertime activities, but why should we limit ourselves to just one season to enjoy one of our favorite foods?! 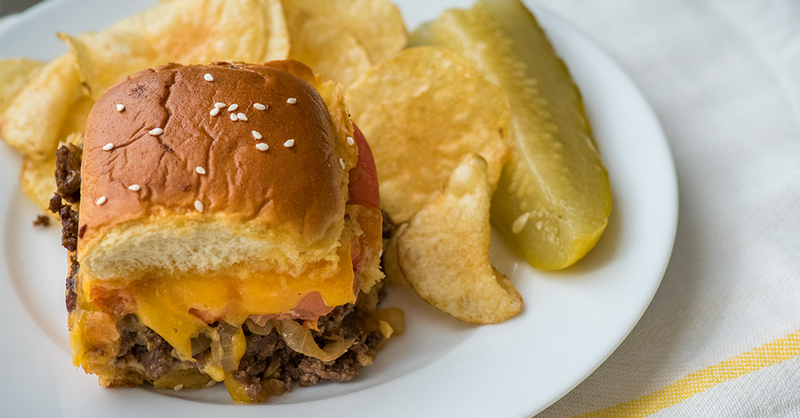 We did a little thinking and came up with a great way to enjoy that cheeseburger goodness year-round, that serves a crowd and doesn’t leave people lining up, waiting for their burger to finish cooking…. The best part is, we can bake these little gems up as a big batch casserole, making them one of the easiest and tastiest ways to enjoy a cheeseburger! These little sliders are loaded with flavor, smothered in melty cheese, and topped with a glaze that is truly mouthwatering. Kids and adults alike will rave about this dish, which is always a win-win in our book! Heat a large skillet over medium-high heat and add ground beef. Let beef brown without moving it for 3 minutes, then flip and continue to brown. Add onion and garlic, and season with Worcestershire sauce, cumin, mustard powder, salt, pepper, and paprika, stirring to combine. Cook until onions are tender and beef is cooked through. Drain fat, then stir in tomatoes until combined. Cut dinner rolls in half horizontally and place bottoms of rolls inside greased baking dish. Spread beef and onion mixture evenly over the rolls, then top with cheese slices. Place tops of buns over the cheese. In a small saucepan over medium heat, melt butter with sugar, Worcestershire sauce and mustard until smooth. Brush mixture over the tops of rolls and sprinkle sesame seeds over the top. Place baking dish in oven and bake for 25-30 minutes, or until buns are golden brown and cheese is bubbly.